Leading the Barnes’ bull herd to the finals is 221 Ralco’s Centrifuge. Iowa fans witnessed Gumby Wren claim the highest-marked bull ride of the 2017 PRCA regular season on him with a 92-point score. Rodeo fans in Wisconsin observed his buckoff percentage increase to 64% in early June. This fall he matched up with three-time World Champion Bull Rider Sage Kimzey at the Wrangler Champions Challenge Finale. J2 Frankie Scott, the bay mare is heading back to the GLCF again this year. 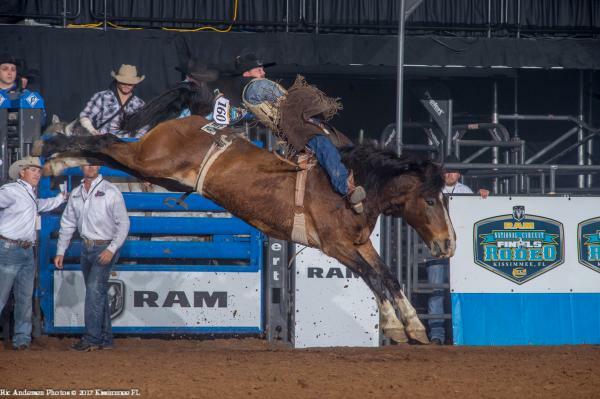 Her rodeo resume includes selection for the 2017 Wrangler Champions Challenge Finale in Sioux Falls, South Dakota; 2017 Ram National Circuit Finals in Kissimmee, Florida and the 2016 Great Lakes Circuit Finals in Louisville, Kentucky. Saddle Bronc Horse 3I9 Barry Crossin’ won at the 63rd annual Buffalo PRCA Championship Rodeo in Buffalo, Minn. The bay gelding took Logan Allen to the pay window and also placed second in Cherokee, Iowa.